The Vazee Prism is an all-day, everyday shoe because of its comfortable fit and feel, based on a large number of comments. A majority of runners considers its value a steal in the market. It has the right mix of flexibility, despite being a very effective stability shoe, noted several runners. A very breathable upper provides a cool and sweat-free coverage. The Revlite foam offers a touch of firmness with still plenty of responsiveness. A deconstructed heel counter offers effective and pliable support. The no-sew upper has a lesser risk of causing blisters. Effortless movement through the gait cycle is such a treat, observed a few testers. A small tradeoff in the comfort and performance is a slight issue in the upper durability, based on a few comments. A handful of runners felt that the minimal upper did not secure the midfoot really well. Wet pavements are not the best surfaces for the Vazee Prism, according to a couple of reviews. The Vazee Prism is quite light for a stability shoe. It is New Balance’s version of a lightweight stability trainer that blends flexibility almost like no other. The superior comfort and incredible breathability with effortless transitions make it a performance support shoe that is tough to match. When I was looking to purchase another pair of shoes to work into my rotation, I was looking for a shoe that was lightweight, a little bit of stability, and, most of all, cost-effective. I have been training for ultramarathons over the past few years, so my shoes saw many miles. With the cost of the newest shoes, my idea was to go with shoes that aren’t this year’s release to save money. I found the New Balance Vazee Prism that seemed to meet my needs. These shoes were to replace my Nike Lunaracer 3 for faster speed workouts and interval workouts. I wear a 9.5 US for casual wear; however, I always order half a size up in my running shoes to make room for my toes. I made no exception with the Vazee, as I ordered them in size 10. The shoe fit as I would expect its length and matches up to a size 10 in both my Brooks and Adidas. What I found interesting is that I have a normal medium arch and forefoot and I discovered that the shoe lacked enough arch support. Also, the toe box was too roomy. This caused me some initial pain in my arches and blisters on my forefoot due to slipping. The laces allowed for a snug lace up, and I have never had the shoe come untied during running. The shoe specifications say it has an 8 mm drop, synthetic/mesh upper, medial post to help prevent over-pronation, and a weight of 9.9 ounces (probably of the size 9). That’s 22.08 ounces for both or approximately 11.04 ounces per shoe. These are size 10, but heavier than I have expected. The synthetic/mesh upper didn’t breath well at all, my feet were always sweaty, and all too often, the mesh is ringed with white salt stains. The midsole of the shoe is very stiff which causes my feet to go to sleep after a short 10-15 mins on every run. I don’t have this issue with any other shoe that I am currently running in. The traction seems to be adequate, although these shoes have only seen 2-3 runs outside due to weather. Unfortunately, we have had record snowfall this winter which has forced me to run on the treadmill far more than I would ever want to. The medial post that helps prevent over-pronation works well. I have a slight over-pronation issue though nothing that causes me to seek out a shoe to correct it. Since I log so many miles, I thought that this might be a bonus for me in this shoe. I have found that the support is really good; however, the back of the shoe has a hard plastic piece that I assume helps with the medial post. The extra support causes some serious pain during full heel flection in speed workouts or anytime I’m running 6 minutes per mile pace or quicker. While I started to use this shoe for my fast workout runs, I have ultimately had to change my plans and figure out what the shoe works best for. Thus I have run some 20 mile runs in them. I have run fast runs in them as well. The shoe has shown little to no breakdown of the support or treads through approximately 250 miles. I fully expect the shoe to hold up for another 250 miles. I haven’t found a comfortable place for these shoes in my running. The shoes are stiff, not comfortable, and not responsive enough for speed work. I do think that shoe will last a long time and, given the price, is a good buy. However, just because the shoe is cheap, you should not have to be concerned that you might end up with some foot and/or toe problems. These are not the worst shoes that I have ever worn, but compared to the Nike Lunaracer 3 that these shoes were to replace, there is no comparison. The Lunaracer 3 won’t last for as many miles, but it is a faster, lighter shoe that you’d be much happier with. In the end, I cannot recommend these shoes. 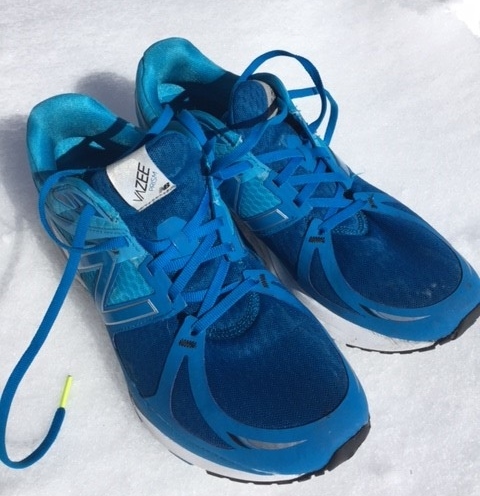 It is very comfortable and offers great arch support during your runs. While managing to stay under 10 oz. of weight, the Prism delivers decent stability thanks to a dual density medial post. The New Balance Vazee Prism offers something every shoe manufacturer works hard to provide in stability shoes. This multi-purpose trainer from New Balance offers the right mix of stability and flexibility in a very light ride. Giving the shoe excellent stability that is not overly corrective is a traditional medial post. Providing that nice blend of flexibility are the grooves in the underfoot, the adaptable upper, and the pliable deconstructed heel counter. The average fit in the heel and midfoot continues to an Oblique Toe Box design that gives more than adequate room in the forefoot, both in width and volume. The slightly wider footprint also helps with the stability of this shoe. Medium is the available width of this shoe. Sizes are on the money with options 6 to 15 for the men’s and 4 to 12 for the women’s. The outsole is a mixture of carbon rubber in high-wear areas and blown rubber in the forefoot for more traction and cushioning. Giving the shoe indispensable flexibility are the deeper flex grooves. The Revlite midsole is very light, durable, a bit firm and tons of responsiveness. New Balance uses a traditional medial post to keep the inward rolling of the foot to a minimum. The combination of these two technologies gives the midsole a nice blend of firmness, softness, and support. The same midsole cushioning is present in the Vazee Prism v2 and some New Balance running shoes. An Open Mesh covers a large portion of the shoe for maximum breathability. Heated overlays provide lightweight support and structure. The no-sew construction gives an irritation-free ride. With a deconstructed heel, the Vazee Prism offers heel support that is not overly stiff. There is still an element of natural movement while heel slippage is prevented. The bootie-style construction holds the tongue and upper together and wraps the foot in comfort. New Balance’s utilization of the Oblique Toe Box affords that generous, but foot-hugging fit.